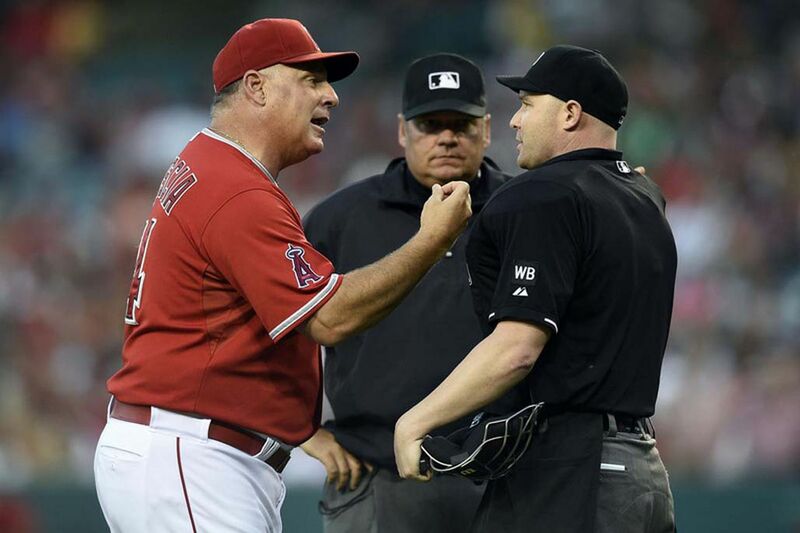 Former Angels manager Mike Scioscia talks to home plate umpire Mike Estabrook. Scioscia stepped away from the Angels after last season. Mike Scioscia turned 60 last month. He’s lived in and around Los Angeles for nearly 40 years now, married a California girl, raised two children there, built one home in the Santa Monica Mountains foothills and purchased another along the Pacific Ocean. But a lifetime in LaLa Land hasn’t quelled the devotion this Delaware County-raised son of South Philadelphians still feels for Philly. He’s gray now with jowls like catcher’s mitts. The rock-hard physique that made him immovable behind the plate in his 13-year Dodgers career long ago softened to paunchiness. But, as if it were a ball in a home-plate collision, Scioscia has steadfastly held onto the attitude, the accent, the passion for his old hometown, its sandwiches and sports teams. Each Sunday, in fact, he lives and dies with the Eagles, coaching them from his couch, cross-country texting comments and complaints to Mike Trout, another hard-core, Philly-area ex-pat and Eagles fan. While he meant “getting back” for visits, perhaps if he’s really that enamored of Philadelphia, the next time the Phillies need a manager they ought to start the search in Southern California. Scioscia, after all, not only wants to return to the dugout, it would be hard to find a more striking counterpoint to Gabe Kapler, the L.A.-born manager who works on the East Coast but remains as SoCal as a vegan burger. Scioscia holds the trophy after the Angels beat the Giants in Game 7 of the 2002 World Series. Who knows, if some day and somehow Scioscia were to land in Philadelphia, maybe he’d shoot a text or two to Trout, who’s never played for another big-league manager, and persuade the superstar center fielder to follow him back home? Trout, a Millville, N.J., native, figures to trigger the hottest free-agent war ever when, at 29, his six-year, $144 million contract expires after the 2020 season. There’s been no indication, of course, that the Phillies will pursue Trout. And, as for Scioscia, he doesn’t figure to be out of work long. The 1976 Springfield (Delco) High graduate was baseball’s longest-tenured manager until, when his 10-year, $50 million contract expired on the final day of a second straight 80-82 season, he decided to walk away. He left with a franchise-record 1,650 victories (18th best all-time), seven postseason appearances and the 2002 World Series championship. But the last three seasons, his Angels had finished below .500, and they’d missed the playoffs the last four. “There are little rebuilds that come along every few years, and you realize, like we did last year, that you’re going to have to wait for young guys to develop,” Scioscia said. “It goes with the territory when you stay in one place so long. So after 42 years of moving to the game’s annual rhythms, Scioscia finally has had to confront an empty calendar, a sometimes terrifying development for baseball lifers like him. For Scioscia, the Dodgers' No. 1 draft pick in 1976, this strange idleness has been exacerbated by a series of disturbing occurrences. It’s almost as if his sudden absence from baseball has disturbed the universe’s natural order. Days before his daughter’s November wedding, a shooting at a country-western bar close to his Westlake Village home left 11 people dead. Then, as his wedding house-guests were departing, the wildfires that rolled through the Santa Monica Mountains reached his property, destroying everything but the house. And then heavy rains threatened mudslides in his neighborhood, which now resembles a moonscape. The rampaging fire consumed three homes on the suburban L.A. street where he’s lived since 1993. It also claimed all the trees, landscaping and outbuildings on his lot. Scioscia might also have lost the house had he not extinguished a small fire in its foundation with a garden hose. While he’ll stay involved with several local charities and a collegiate baseball league he helped form, that house is where Scioscia figures to be when spring training commences without him. His Sept. 30 departure from the Angels happened with surprisingly little rancor. Ownership confirmed it was the manager’s decision. His players praised him. And a tearful Scioscia was anything but bitter. In fact, other than the playoff drought, the only real criticism that surfaced was the manager’s grudging acceptance of the analytics that now dominate the sport. Scioscia, who took some computer science courses at Penn State in the late 1970s, said he eventually came to embrace the data but didn’t do so at the expense of the seat-of-the-pants instincts a baseball lifetime had developed. “Teams that have that balance are the ones that are going to have success,” he said. “Look what Boston did. They ran the bases like demons. They did all the things you need to do. They put the ball in play with two strikes. They had a great approach with guys in scoring position. All these things are still part of the game of baseball. Sliced up like one of those Philly cheesesteaks Scioscia misses as much as he figures to miss occupying a dugout.